Why Damnoen Saduak Floating Market is special ? Having now been replaced by supermarkets and shopping malls, Thailand's remaining floating markets are an enduring symbol of what life was like in days gone by. 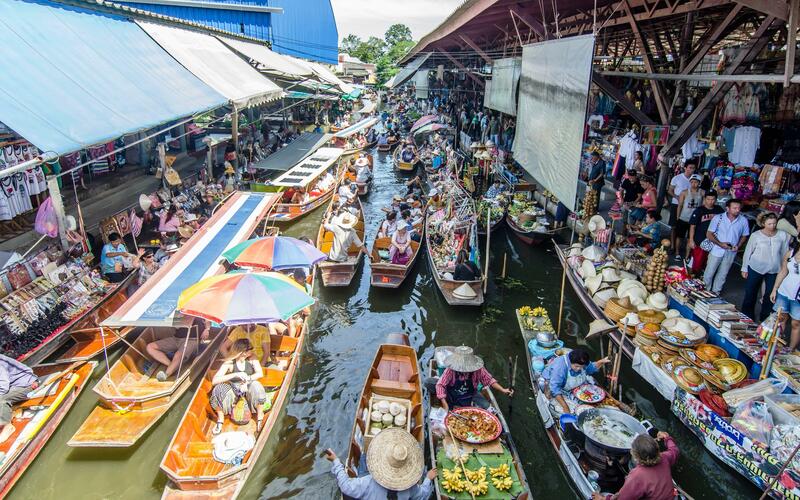 The popular floating market in Ratchaburi, known as Damnoen Saduak Floating Market, is one of Thailand’s largest. Sellers arrive early in their boats laden with tropical fruits, flowers and other fresh produce, creating an exuberant and vividly colorful scene that has been captured by photographers the world over. It's a touristy scene but worth the crowds in order to experience this unique and infectiously chaotic market. Hire a long-tail boat and make sure you bring your camera to capture this quintessential image of Thailand. It is also worthwhile exploring the nearby canals (klongs) to gain an appreciation of how the locals live. What to explore at Damnoen Saduak Floating Market? Unlike most of the other floating markets, the popularity of Damnoen Saduak attracts many fruit sellers rowing their boats along the narrow canals, meaning that you’re guaranteed great pictures. There is plenty of tasty food to try along the docks, from freshly-made mini coconut pancakes to boat noodles in their rich meaty broth. How to get to Damnoen Saduak Floating Market? The Damnoen Saduak Floating Market is 110 km (68 mi) west of Bangkok, in Ratchaburi province and about 40 minutes by car to Nakhon Pathom. Don’t forget to bargain while renting a boat. It’s best to take a trip early in the morning to see the market at its busiest and most colorful. Many people who visit the market combine the trip with a tour to the Rose Garden cultural resort because in one hour you see enough since the place is not very big. Not to shop there for souvenirs as they are quite expensive. The best buy are the local fresh fruits or which can be bought off the vendors on the boat. For photography, the views are much better from above. Should go very early, but it's a very cool experience. You better be ready to wheel and deal with the merchants. Before riding the boat someone will take a photo of you and your companion, don’t hesitate to say no because if not after your boat trip they will let you buy that printed photo with a frame for 300baht. Don't buy things here, they are not that cheap. The Damnernsaduak floating market, or Damnoen Saduak (I'm not clear on the proper spelling) is an experience like no other. Though it's become somewhat touristy in recent years, this is a century-old authentic old water market through which you navigate on little private boat with a local guide (haggle a bit on the price and it's super cheap.) The boat will take you down rows of watery alleys lined by little wooden stalls hocking anything from fruits and veggies to local art, carvings and spices. It takes up to two hours to get there from Bangkok depending on traffic, and you're best to go very early, but it's a very cool experience. Set up mainly as a tourist attraction, the market was traditionally for farmers, cooks, artisans and craftsmen to peddle their wares. 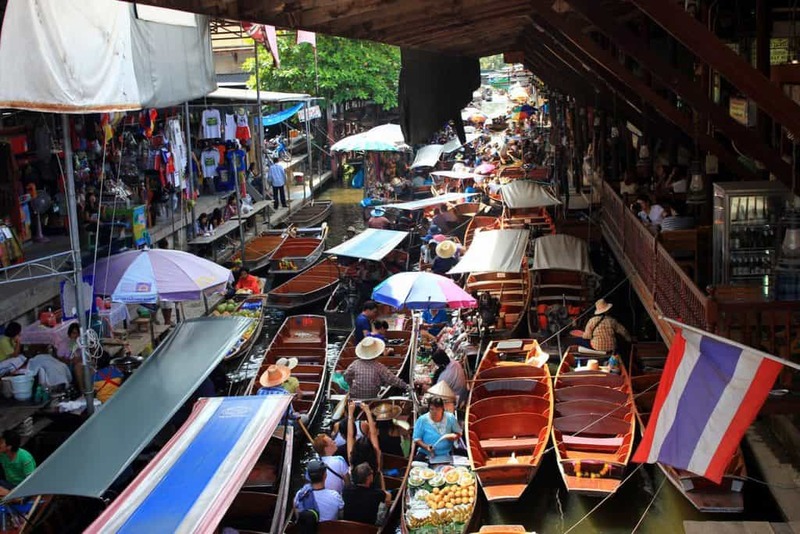 You can still buy fresh produce and barbecue or noodles from the paddle-powered long boats run by the old women of the area, but the market is mainly stalls set up along the canals selling tourist-type souvenirs. It is mostly stuff you can buy in any number of places in Thailand, but there are occasional local crafts and stalls at which you can buy something unique. The people can be a bit pesky but as with anything in Thailand, if you don't want it, either ignore them or smile and say 'no'. You can barter: I managed around 20% off most things without too much hassle. A couple of hours will do this attraction for most people, and we combined it with a trip to the Maeklong Railway Market, which is a must-see. The best time to visit the floating market is 8am before the tour groups arrive. A boat will cost you about 700 baht for 1 hour for 2 people. We've booked a half day trip from Bangkok to the market. When we arrived at the market it was clear that the main target are tourists.Therefore, the experience was not quite authentic. Hence, if you want a tourist attraction and want to buy the usual stuff you get at every other market as well, it might be worth going. Enjoy a long tailed speed boat along the canal, and see the daily morning congregation of produce-laden boats as farmers and smallholders trade their goods. The Damnernsaduak floating market, or Damnoen Saduak is an experience like no other. Though it's become somewhat touristy in recent years, this is a century-old authentic old water market through which you navigate on little private boat with a local guide (haggle a bit on the price and it's super cheap.) About 1 1/2 hours south of Bangkok you will find the hustle and bustle of these floating markets, all trying to sell you their merchandise, but what a great thing to experience. The boat will take you down rows of watery alleys lined by little wooden stalls hocking anything from fruits and veggies to local art, carvings and spices. It takes up to two hours to get there from Bangkok depending on traffic, and you're best to go very early, but it's a very cool experience. A real people watching experience and to get amongst it all was just fantastic.